One of the primary responsibilities of any government (both executive and legislature) in any country is the management of the public purse: the government budget and the national debt. As developments in Europe demonstrate, bad management of government expenditures could lead to financial collapse and government default. Although the U.S. is in a much better financial footing then most European countries of similar socio-economic and development level, dealing with the national debt has captured the attention of most politicians. 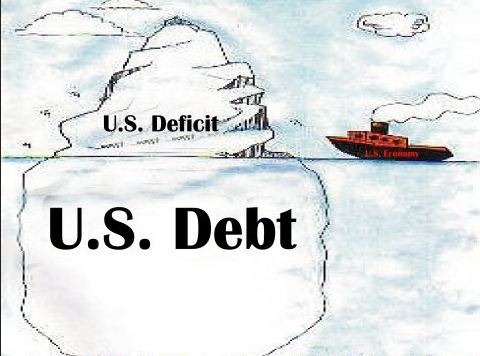 Proposals for the reduction of the government deficit and eventual elimination of the national debt have come from both sides of the political spectrum, including bipartisan efforts like the Simpson-Bowles Commission (see: National Commission on Fiscal Responsibility and Reform). Democrats primarily want to raise taxes on the wealthier Americans (repeal Bush tax-cuts) and reduce the defense budget, in order to close the deficit gap. Republicans on the other hand want to primarily reform entitlements (Social Security, Medicare, and Medicaid) which combined account for close to 45% of the Federal budget and will only get larger due to demographic changes. Most likely, the right solution lies somewhere in between, which is what was the recommendation of the Simpson-Bowles Commission: raise some taxes, reduce some defense spending, and reform entitlements for future generations. Unfortunately there is no guarantee that even if our current political leaders were able to adopt such a grand compromise, future generations would not commit the same ‘management mistake’ of past decades: cut taxes which reduces government revenues, while expand government spending through borrowing. Some on the right have argued passionately about the need for a ‘balanced budget amendment’ to the Constitution. Constitutional amendments are hard to pass, and even harder to change in the future; although the sentiment might be just right considering the danger that out of control debt can pose to a national economy and future generations. However, instead of looking for funding to cut and taxes to raise, there might be another way to restructure the federal budget in a way might have a more lasting impact. Republicans are right about one thing regarding the federal budget deficit and the national debt: it’s irresponsible for our society to leave beyond its means, and pass the burden to future generations. On the other hand, it was under a Republican President and a Republican Congress during the past decade that a budget surplus turned into a budget deficit. Republicans failed to uphold their ‘fiscally conservative’ principles because they got trapped by our current system of governance. Just like in Greece, the cause of our increasing deficit and debt is more political than just fiscal: a system of governance that has concentrated too much power at the federal level, and therefore too far away from the people to appreciate the consequences of their political choices. Since the creation of our Republic, economic power and fiscal responsibility (and therefore accountability) has been slowly shifting away from the States and concentrating with the federal government. In times of national crisis (Civil War, Great Depression, WWII) this makes sense, but eventually people at the local level have to be ‘empowered’ again. Until we are willing to acknowledge that, and consider the possibility of shifting both the funding and the responsibility to States and local governments, politicians at the federal level will never escape the temptation (trap) to keep spending and keep pandering. Furthermore, internal economic competition played a significant role in economic growth during the 19th and 20th century. States pursue their own economic policies, and competed with each other both for attracting industry and labor. States already enjoy ‘comparative advantages’ as industry and geography has led to specialization at the local level. Michigan has cars, California has entertainment and software, Texas has oil, Florida has oranges and tourism, Massachusetts has medical and pharmaceuticals, and a number of Midwestern states have agriculture in the form of corn, wheat, etc. The issue therefore should not be how to change the federal budget and reduce government spending – rather it should be how to better divide government expenditures in a way that more efficiently and responsibly empowers people again. People need to appreciate the difference between truly national spending obligations, that impact the whole country, and more local/regional spending obligations. It is important to distinguish again between the federal government and the state government – who provides what and why! Education, defense, retirement, and homeland security, are all obligations that impact all of us. On the other hand, subsidies for oil and corn production, unemployment compensation, and healthcare are legitimate choices for people to make at the local level, and don’t belong in the federal budget. 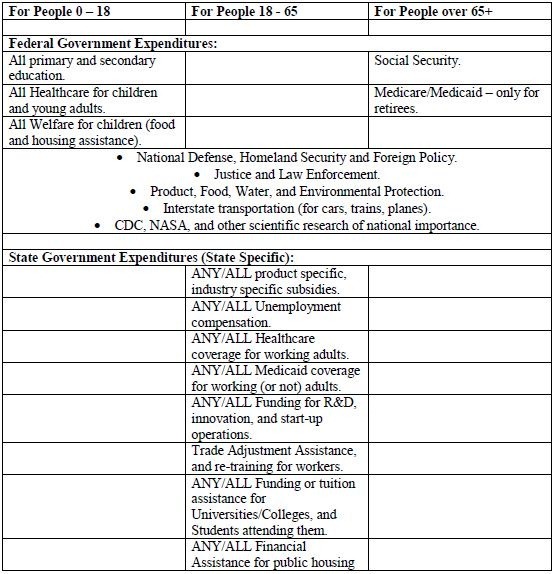 What if we were to classify government spending based on the age of people, and then accordingly divide it between federal government and the state governments. In general, we can divide people in two categories: those who cannot work (due to age, or some disability), and those who can work (of working age). Overall, people under the age of 18 (or 21 if they are attending college) and after retirement (over 65+) are generally consider as being not of working age. Sure, some teenagers can work part-time at 16, and some adults can keep on working after 65, but overall people under 18 and over 65 will not be working. They will also not be able to relocate if economic conditions on their current location got bad or where not good enough. A 12 year old kid who does not like its public education, local property taxes or environmental pollution cannot ‘relocated’ to another state. Similarly, a 75 year old retiree whose state government decided to reduce healthcare benefits cannot move as easily to a more favorable jurisdiction. People under 18 and over 65, in general have to take the world as it is, and hope that those that government take their needs into consideration. Therefore, the federal government budget should be realigned to focus on people “under 18 and over 65,” leaving most other funding needs to the States. Healthcare and education for people under 18, and Social Security and Medicare for people over 65, will make the bulk of federal funding for these two age groups. Also, what transcends state and national boundaries (defense, homeland security, transportation, foreign policy, and environmental protection and product safety) should also be administered by the federal government. From a moral point of view, it is imperative that as a society we can guarantee that all children will receive at least equal educational funding and that our most vulnerable retirees (who worked their whole life and paid their fair share of taxes) will be taken care off. Children raised in the Midwest, will go to college in the cost and may end up working and raising their families in the south – while ultimately retiring in one of the few states in the U.S. with the ideal retirement climate. Only the federal government can deliver funding and services to these two age groups in a uniformly equal and comparable way throughout the country. States should have to compete with each-other, both for attracting the best workers and by promoting local business. Similarly, people should demonstrate their approval or disapproval of State economic policies (and benefits provides) with their feat. Labor mobility is what sustained the phenomenal economy growth of the 19th and 20th century, and it’s what is partially to blame for the stagnating EU economy. We used to be a much more mobile society and economy. Unfortunately, success of the past decades coupled with the expansion of the federal government’s role in the economy (to the detriment of state economic planning) has made us much more willing to stay put and expect solutions from Washington. Also, if the federal government is covering the welfare cost of people under 18 and over 65, States should be free to decide for themselves how to handle healthcare, unemployment compensation, disability coverage, and housing assistance for their residents of working age. The competition for skillful labor will encourage competition among the States to provide the best social safety net for their citizens. This division will couple direct services (employment, healthcare, housing) with State governments and indirect services (defense, environment, transportation) with the federal government. Overall people between the ages of 18 and 65 are free to move about the country and pursue their ‘American Dream.’ They can change jobs, change homes, go back to school, or do nothing at all, and despite our common language and common currency, life in the various states can be as diverse as living in different EU countries. Adults between the ages of 18 and 65 will probably need less ‘education’ then children and less healthcare then retirees, but a lot more ‘economic development’ initiatives, subsidies and tax breaks that will create jobs and promote growth. The problem with our out-of-control federal spending is that it is happening at the federal level. It’s easy to keep cutting taxes while letting spending grow at the federal level, because it’s very hard for average people to follow or influence the inner workings of the federal budget. If most (at least discretionary) taxing and spending were happening at the State level, it would be easier for people to be more involved and more engaged. The overall objective should not be to just cut government spending that might be very essential to a lot of people. Rather, we need to find a way to bring the federal budget closer to the people. Dividing spending between people of working age and those out of the labor market (due to age) might be a good first step. Overall, the Federal Government should finance all expenses associated with children and senior citizens, plus defense and national security. Overall, States should finance all economic growth and job-creation activities within their jurisdictions, thus creating economic competition among different states.